A big joke in my family growing up was about how much fun we had eating in the car. I always loved the togetherness created by eating in the car. We would head out on a big trip, we would go through a drive-thru, and mom would start passing stuff back. I KNOW it sounds weird, but these are fond memories. Don’t know if you remember, but we went to Columbia a few weeks ago to visit some friends. We left a bit later than we had intended (we were having too much fun) and I just knew KB was NOT going to make it home. We decided to go through the drive-thru at McDonalds and Honey would sit in the back and feed the kids. It was hilarious. It was like feeding time at the zoo. . .
yes, that was my question too! Yeah, and was she driving at the time?? so glad to see you’re starting the tradition with the young ones! 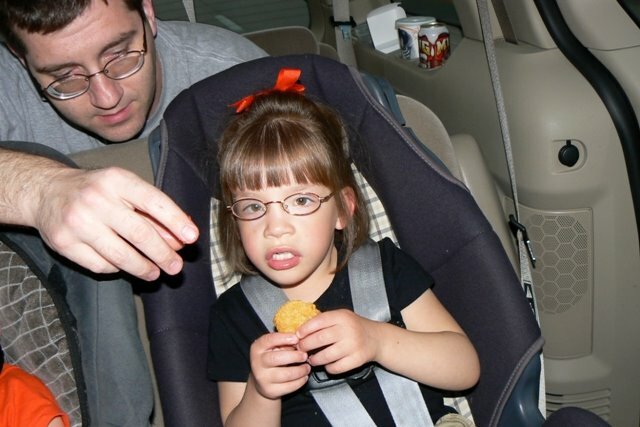 My mom used to never let us eat in the car…not even one fry! So I love it too! And AC has eaten nuggets and fries in the car on a few occasions too.